Visual report filters allow you to better analyse trends and patterns in your form responses by creating rules to determine which results are included in your charts and graphs. 1. 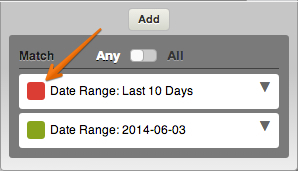 Date Filters - Include/exclude responses based on the date they are received. 3. Submission Filters (Coming soon). 1. Click the Filters icon on the report builder toolbar . 2. Click the add button at the top of the dropdown . Current Day - Responses received on the day the report is being viewed*. Current Week - Responses received in the week(Monday - Sunday) the report is being viewed*. Current Month - Responses received in the month the report is being viewed*. Current Year - Responses received in the year the report is being viewed*. Last x Days - Responses received x number of days previous to the report being viewed (The value of x is chosen when creating the filter)*. Exact Date - Responses received on an exact date chosen by you. Custom Date Range - Responses received in a date range chosen by you. *This filter is dynamic and the chart data will change according to the day you are viewing the report. 5. Based on the filter you have chosen you may now be asked to enter values for the filter to use. 6. 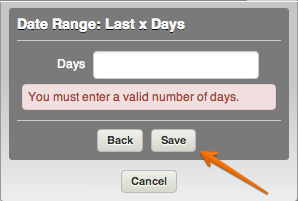 Press save to save any entered values and create the filter. If you have entered any invalid data you will be shown an error similar to the one shown below. 7. The new filter will then be added to the filters list, and the filters counter will increase to show you the current number of active filters. A loading icon will be shown whilst the new filtered data is loaded and then charts and graphs will be re-rendered to show the filtered values. There are 2 ways to manage or modify existing filters. 1. Click on the filters manage trigger to bring up the 'Manage Filter' menu. You will be able to choose from the following options - Disable/Enable Filter, Edit Filter(Only available if the filter has editable values) and Delete Filter. 2. Change the Match switch. This switch decides whether you want Any of the created filters matched or All of the filters matched when your chart data is generated. If you choose to disable a filter, you will be able to distinguish it from active filters by the red status icon. If you have any questions, suggestions or comments, please kindly post them below. I want to be able to generate reports based on items purchased through jot form. People have bought books, t-shirts, tickets and more but when I want to get totals for a specific item, I can't. The self generated spreadsheet lumps all of the purchased items in one column, which defeats the purpose of this spreadsheet. I currently use Formstack for several of my consulting clients and REALLY want to switch to Jotform (for a variety of reasons)----but, the inability to filter the submissions such that I can allow folks to view only a subset of the submissions (ie by client, or facility location, or department) keeps me tied to Formstack. PLEASE release beta for this feature soon :-)!!! Is there another way to view the list of all the filters set up for a report? I have a lot for this one but I can't seem to scroll to the bottom of the list (See attached screenshot). I am using the latest version of chrome. May be a bug to have your developers look at. Can report do Sum, average...? How do you get the Yes/No/NA responses from checkbox to show as a trend in a graph? This is a great tool in collecting data, but how do I display the gathered data? Would it be possible to add a filter based on a Number answer? 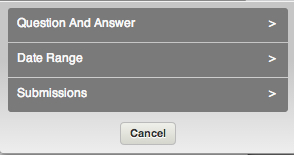 I'd like to be able to filter using the respondents' Age but it's not showing up in the drop-down list. I'm only getting date filters to choose from and they aren't loading after I select any date range. colorization of the items in an futur release ? I am trying to get a report of the responses on my form. Adobe Forms Central would provide a color code data break down of the amount of responses, the ages, the grade, school...etc. How can I capture this information? interested in when submission filters will be available as well. Any info? Any update on when these additional filters will be available? Looking at moving from AdobeForms where advanced filtering was possible. I made a survey using the survey tools. How do I pull the results of the survey? Before I made the survey I read where you can pull graphics and pie charts. I cant find how to do that now. Could you point me in the right direction? It 'a good start. But the solution is useful for us to regard the conditional filter out all the answers, not just the date. We must be able to show on the internet only answers that satisfy certain criteria. We look confident in your abilities. Excellent Update. Any idea on ETA on Question and Answer and Submission filters and what they will allow? Parabéns à equipe JotForm, pela implantação dos filtros. Excelente ferramenta para os relatórios. Uma sugestão para melhorar ainda mais essa ferramenta, seria possibilitar que os filtros criados no relatório visual, pudessem ser escolhidos no relatório publicado. Se o relatório tem filtros para: Mês Atual e Ano atual, o relatório publicado permitisse ao usuário filtrar essas respostas. Why is our email history log is empty?